In it, we explored why it is so hard to stay inspired and constantly come up with fresh ideas and hopefully I’ve helped you move past some of your fears and find more joy in your creations. I want to take that one step further. I want to ensure you will always be inspired and be able to create cards that you love and that your loved ones simply adore. We’ve all tried to find inspiration in magazines and online galleries but unfortunately we all run into the same problem – while the cards may look gorgeous, they usually don’t tell you how to make them and if they do, you have to have all sorts of fancy supplies and equipment to make them yourself. I thought that was simply unfair. Everyone should be able to indulge in the joys of card making and be proud of what you create. So, I wrote my own card making guide full of timeless ideas that can be adapted to suit any level of experience, any theme and any style. It’s been many hours of work and lots of love but it’s finally here…well almost. I’m so excited! I wish I could share it with you right now. I have worked so hard on this to ensure it is the most useful easy-to-follow guide to card making that’s chock-a-block full of ideas. And I’m only two days away from being able to share it with you. I really do feel like a child waiting for Christmas, counting down the sleeps before Christmas morning. I’d really love to know what you think. Please leave a comment below and let me know. Wow, that looks great. I live in Canada – will it be available here? I would love a copy of this book, I live in the UK where abouts can I get it from please?!?! Do you have an ISBN number or anything like that I could use as a reference. Also what is the cost?!?! Looking forward to getting a copy. Hi! Can’t tell you how much your Inspired Christmas Card Making printoff has helped me as I am fairly isloted where I live. 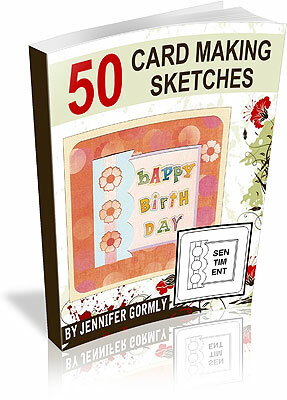 Where in Australia can I purchase a copy of ” 50 Card Making Sketches”. Can’t wait it looks brilliant. Lindy. I’m looking forward to your new book too! Looks great, and the two reports have helped me a lot. When will we be able to purchase this in the USA? Will we be able to purchase this on line? Thanks a lot for your incredible ideas! and Congratulations for your book! I live in Costa Rica but I hope I can get it somehow. Thanks again and God bless you!!!! I think it looks great too. I hope to find out how to get my copy. I’m always going to parties and getting inspired, but also have to buy something each time. SO this looks great!! Will it be available in New Zealand please? If so where can this be purchased. I can not wait to get a copy of this book! Where will it be available for purchase? You are so generous with you time and ideas, Thank you very much! I will be getting your book as soon as it comes out! It just loooks fabulous, and like the rest, I would just love to hear, how we can get it and how much it will cost too? Will it be available here as well? I´m i Denmark, or will it be possible to buy it online? I´ll just love to get it, if it´s possible here too, that´s for sure. And thank you sooooo much for all the hard work, you´re putting into helping all of us. thought it looked great and anything that gives me ideas and the know how to put these ideas into practice without having to spend a fortune is a bonus for me so will be looking forward to your book and having a proper look inside it. Looks great, anything that can help, especially with a brain block would be great, will definitely have a look when released. I would like to purchase this book because your two reports that you gave us on sketches has been very helpful to me. I am new to cardmaking and I truly enjoy it. I made a Christmas card using the sketch that you last gave us and it is really nice. My daughter who has been doing this for years was very impressed. Can’t wait to find out where the book will be available. Looks great again Jen – may even make some more cards though I thought I had finished for this year with only finishing touches & enveloping to do. You have turned me onto card making after making so many scrapbooks that I need another creative outlet. You make it so easy and I can adapt your samples to many other cards. I cannot wait to get this book and look forward to your telling us where in the Chicago area we can find it. Wow!! Congrats!!! That book looks very interesting!!! My problem is that I live in Guatemala, so I´m worry cause it is probably that I culdn´t buy it. That´s why I would like to know if it will be for sale on internet pages like Amazon? Cause that would be asome for me: It´s a chance for me to buy your book. looks and sounds good to me how much is it going to cost? It looks fantastic…..can’t wait for the 20th. Is it still available? You are very generous with your patterns thank you. Do we buy them direct? Congratulations – it will be a huge success which you deserve. I sure hope we get to see it here in South Africa. Congratulations the book looks extremely interesting I hope it will be available in South Africa. Looks good…can’t wait to open it!! Hi, jen, i would love a copy of your new book.I live in South africa.Will it be available in South Africa. Congratulations – great book. I hope it will be available in South Africa soon. Looks woderful. I love your other 2 books. So helpful. Would love to get this one. How much and will it be available to download. You have out done yourself with this cover and I am sure the contents of your book will be just as great. If the Scrapbooking book is anything to go buy this cardmaking book will be even better. Thank you for talking the time to put both books together for crafters that are not as inspired as you are. Jenn it sounds simply amazing, I would really like to get a copy, I am in Wisconsin, how can I purchase this book. but I can’t find how to purchase your book. The link is at the top of this page for you. You should also have received an email with all the details.